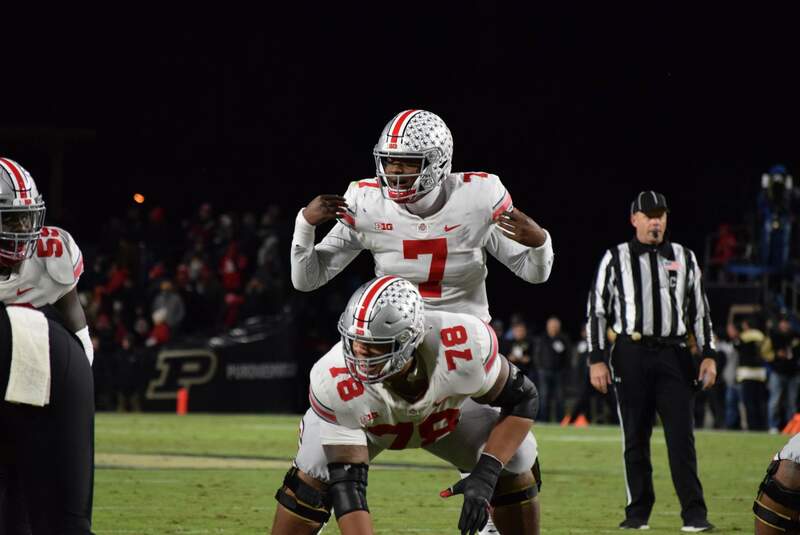 For the third time this season, Ohio State found itself on the road, in primetime and trailing in the second half. 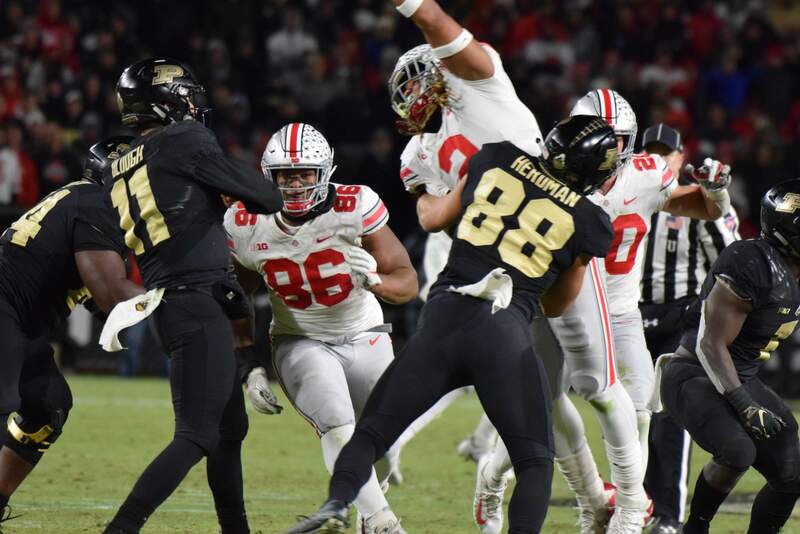 Unlike the rallies vs. TCU and at Penn State, the Buckeyes were unable to overcome Purdue’s big-play ability and suffered their first loss of the 2018 season, 49-20, at Ross-Ade Stadium. 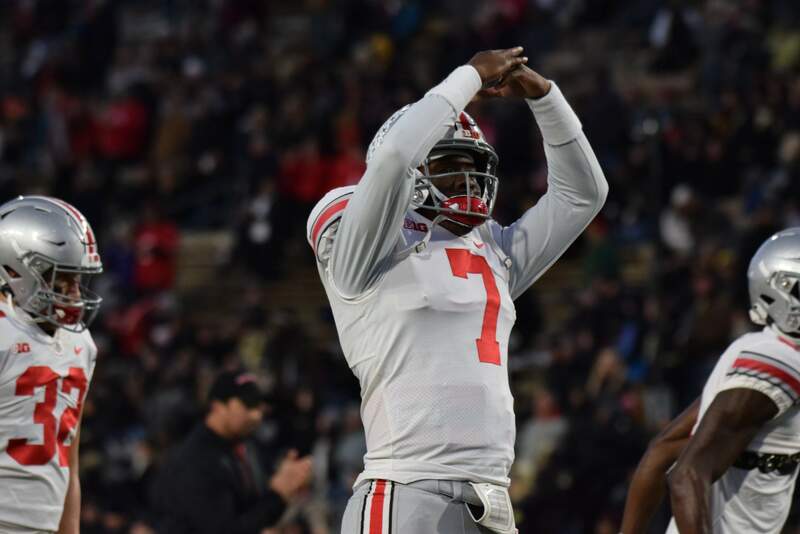 Quarterback Dwayne Haskins continued his record-setting season, establishing school records for single-game completions, attempts and yardage as he finished the night 49-73/470. Ohio State, now 7-1 and 4-1 in the Big Ten, heads into its bye week before welcoming Nebraska Nov. 3 in Ohio Stadium. Kickoff time for that game is to be announced. Purdue was able to put together the only scoring drive of the first quarter, as QB David Blough found Isaac Zico on a 13-yard pass in the corner of the endzone to put the Boilermakers on top 7-0 with 1:10 to play in the opening quarter. The play capped off a 98-yard drive that was keyed by 23-yard pass to D.J. Knox on second-and-25 that put Purdue at the 12 yard line. Two plays later, Blough connected with Zico on the touchdown. In the opening frame, Haskins completed eight of his first nine passes to seven different receivers for 47 yards. LB Malik Harrison made five first-quarter tackles – including a TFL – while Chase Young and Jonathon Cooper combined for a sack. After Ohio State missed on a 33-yard field goal attempt late in the second quarter to cut the lead to 7-6, Purdue raced downfield with a couple long plays to get into position for a field goal. It was a fake, and holder Joe Schopper gained four yards to give the Boilermakers a first down at the Ohio State 9 with 31 seconds to play. 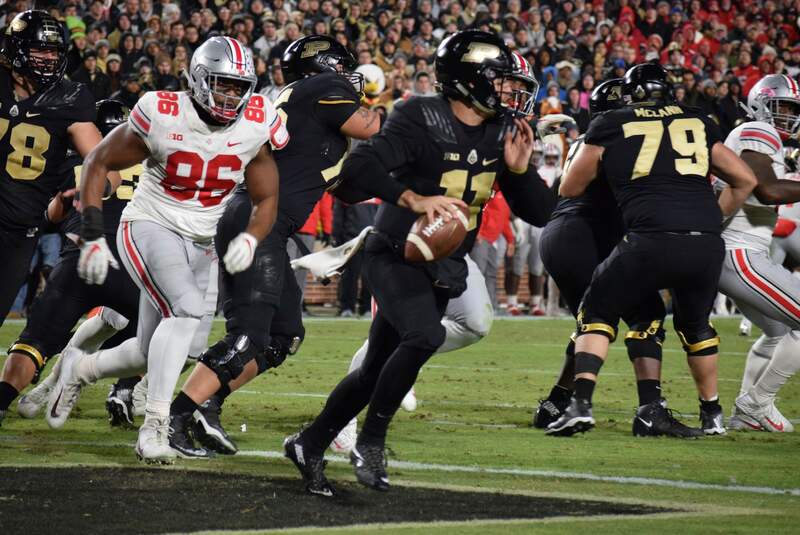 On the next play, quarterback David Blough hit Rondale Moore on the right side for a 9 yard touchdown and a 14-3 lead on the Buckeyes heading into the half. This is the first time since the second half of the USC game last season that Ohio State failed to score a touchdown in a half. 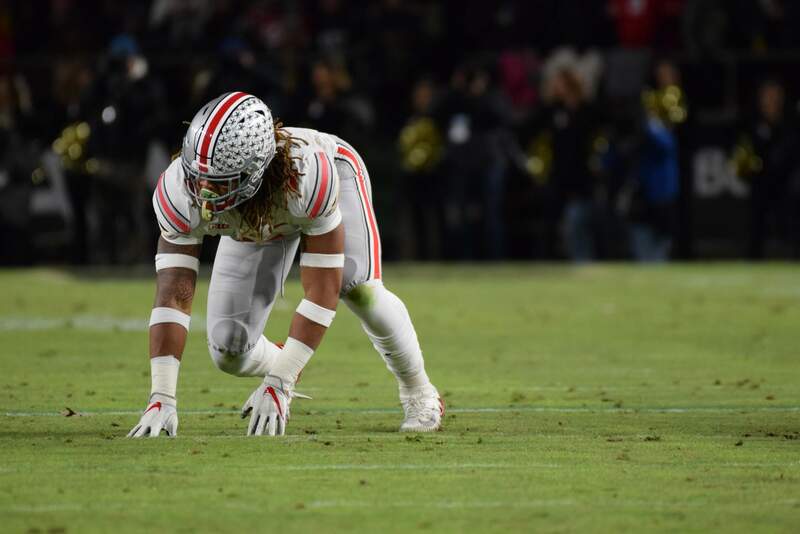 Penalties have hurt Ohio State: 9 for 71 yards. Haskins was 20 of 26 passing for 176 yards. Purdue leads in total offense: 256 yards to 207. Ohio State has just 34 rushing yards and is averaging only 5.0 yards per play. The Buckeyes opened the second quarter with a Blake Haubeil 24-yard FG after a 48-yard, 6-play drive to cut the Purdue lead to 7-3. Ohio State took the opening kickoff of the second half and marched 69 yards in 10 plays in a drive that eventually resulted in a 23-yard Blake Haubeil field goal, his second of the game and fifth in the last two contests. Key plays on the drive included a 15-yard completion to Parris Campbell and a 24-yard hook up with Austin Mack. Purdue answered with a 10-play drive on its own, this one resulting a one-yard D.J. Knox touchdown run. The Boilermakers were aided by a roughing the punter penalty on fourth-and-three, resulting in a first down. Four plays later, Knox scored from one yard out to give Purdue its largest lead of the game, 21-6, with 8:36 remaining in the quarter. 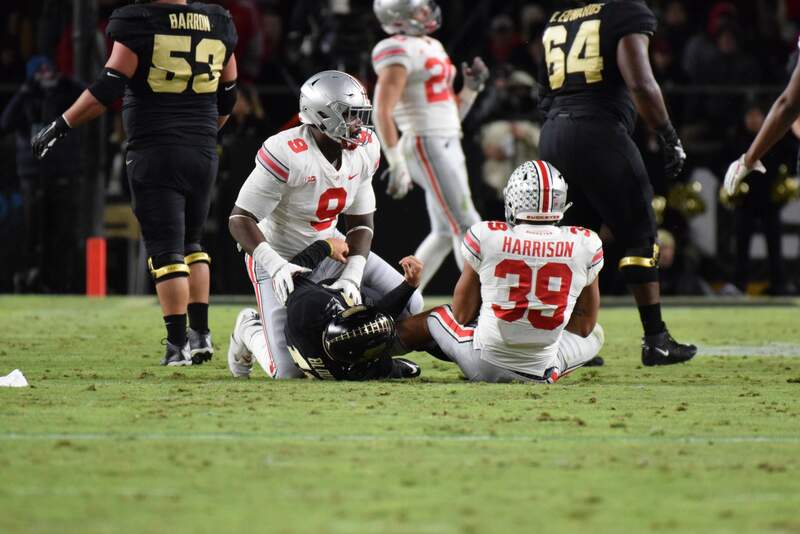 Ohio State’s next drive once again went deep into Purdue territory, but ended with an incomplete pass on a fourth-and-one attempt at PU’s one yard line. The Buckeye defense, however, forced a quick three and out on the Boilermakers next possession. Knox rumbled 42 yards for his second score of the night to cap a 76-yard drive for the Boilermakers covering eight plays in just more than 3:00. 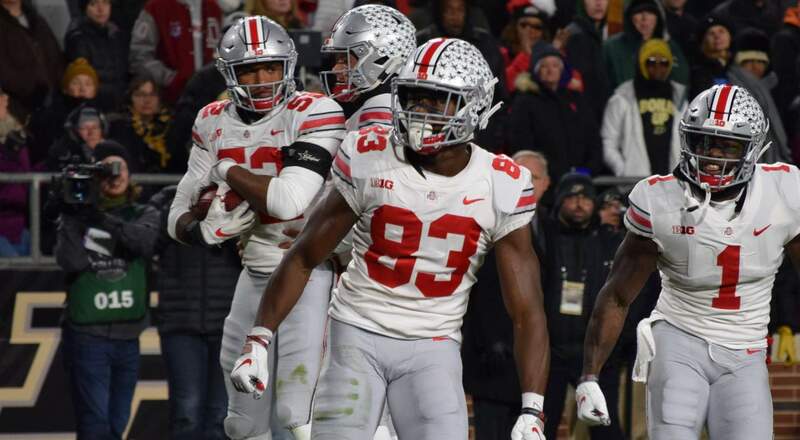 Ohio State answered on its next drive, converting a fourth and five with Haskins finding Victor and then on the next play Haskins hitting Johnnie Dixon for Ohio State’s first TD of the night from 32 yards out. On the next Purdue possession, Knox accounted for his third-consecutive touchdown. This time, he scampered up the middle again for 40 yards to put the finishing touches on a 75-yard drive. 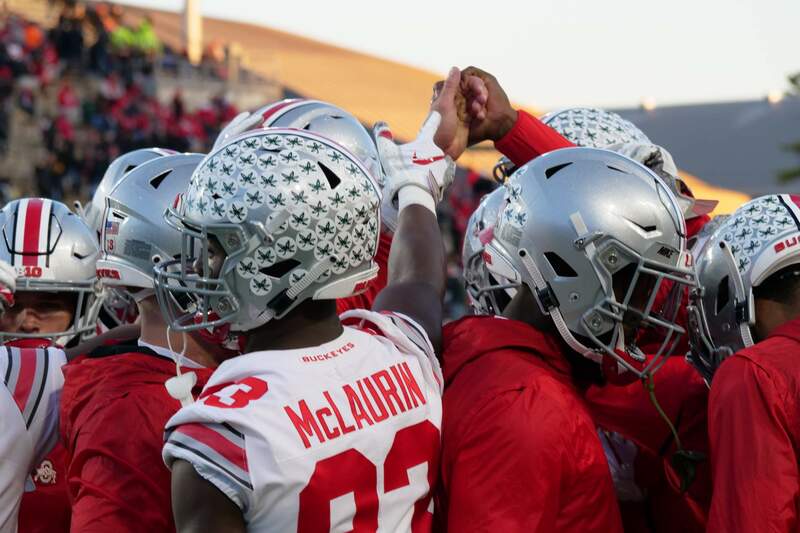 The teams continued to trade blows as the Buckeyes converted another fourth and five with Haskins finding Terry McClaurin for a 34-yard scoring strike to complete a 70-yard drive in just more than 2:00. Purdue’s big-play ability put the game away as Moore broke loose for another 40-plus yard TD to put the score at 42-20 with just more than three minutes to play. Purdue tacked on a pick-6 in the final moments of the game to cap the scoring for the evening.